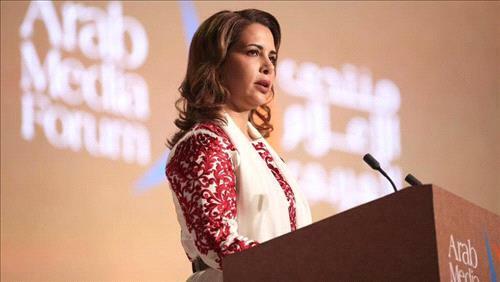 AMMONNEWS - Dubai’s Princess Haya bin Al Hussain launched the annual Arab Media Forum by calling for the lifting of restrictions on media freedoms so Arab journalists can do effectively do their job. “I call for the lifting of restrictions on the fourth estate, the “media”, in order for them to play their role in the disseminating the real image of the Arab world with credibility and respect for the law,” she said. Her comments come as she, and Dubai ruler Sheikh Mohammad bin Rashid al Maktoum, inaugurated the 15th edition of the two-day forum which brings together journalists, media personalities and analysts. This year’s theme was “Media for Good” and highlights the role journalists play in promoting humanitarian principles. Princess Haya also spoke of journalists’ rights, saying only when they are protected can society truly advance. “Give professionals their due rights to secure a decent living. We need a new charter for this profession, where the truth is our objective, and is delivered through credible news,” she said. Press freedoms in the Arab world has been dire, with Reporters without border ranking Arab countries in the bottom of their Press Freedom Index report in as many years consecutively. The digital revolution: cause for good? In her keynote speech, Princess Haya also spoke of the coverage of some Western media outlets, highlighting their tendency to be selective of news events happening in the Arab world that perpetuate a false stereotypical image of Arabs and the Middle East to the West. “There have been efforts by some Arab media to distinguish between dark obscurantist thoughts and thoughts of tolerance and respect for human rights,” she added. Meanwhile Jordanian Deputy Primier and Foreign Affairs Minister Nasser Judeh spoke before the 2,000 strong audience about the relationship between media and politics. “The electronic evolution is a double-edged sword. On one side, it’s a platform for confrontation and voicing opinions, and on the other it’s being used to spread hatred,” Judeh said. Speaking to Al Arabiya News Channel, which hosted the main session on “Media and Terrorism”, Asharq al-Awsat’s Editor-in-Chief Salman Al Dosari said media outlets should not fall easily to extremist propaganda, especially after the rise of ISIS. The session focused on the questions of Arab media rising to the challenge posed by radical and extremist thinking and how they can prevent extremist groups from exploiting social media platforms. In the past where once extremist groups the likes of ISIS and al-Qaeda condemned the use of technology are now at the forefront of best using the tools to further their own agenda. Much media debate have criticized that ISIS publishing ISIS propaganda does more harm than good given that the extremist agenda is furthered, even as far as being used for recruiting more members. Dosari says that the Arab media needs to refrain from publishing extremist videos, saying that it is still important to report the story without inciting. “There’s no escape from covering the news about terrorist attacks, but we as a newspaper at Asharq al-Awsat make a conscious decision not to publish pictures of dead bodies,” he said.